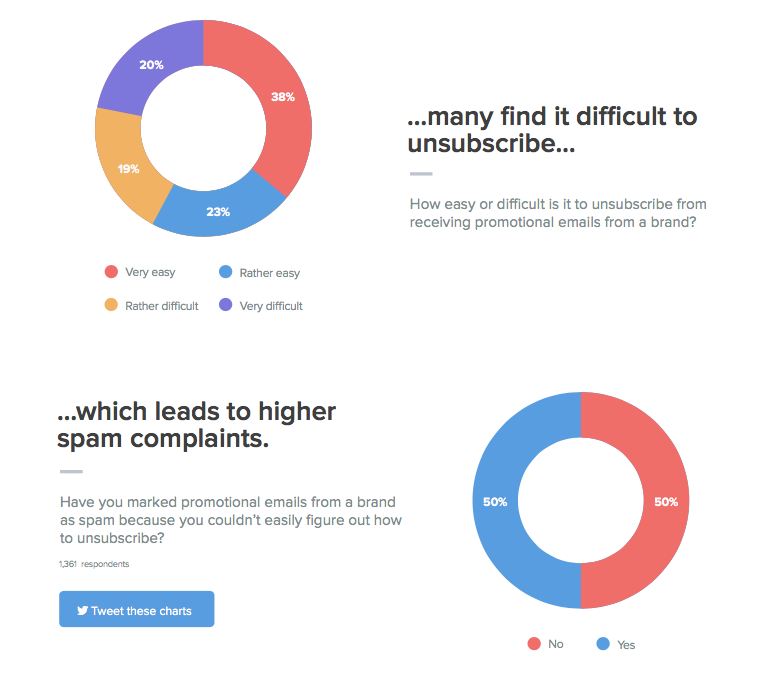 'Unsubscribe' is commonly seen as a spam trigger word. Does anyone respect that? Where do you stand on this? Have you taken any steps to provide an unsubscribe link without using the word unsubscribe? Hi James. This sounds like a myth to me. Unfortunately, there's lots of outdated advice on the interwebs, especially as it relates to spam. My recommendation would be to continue to use "unsubscribe" because this term is widely understood by subscribers. If they are looking for the unsubscribe link, but can't find it, they're much more likely to mark your email as spam instead. I'd hate to see you get more spam complaints in an effort to avoid being marked as spam—oh, the irony! Thanks for the reply Justine! Are there any resources you'd recommend on verbiage to explicitly avoid? The article you linked does a great job of talking about spam verbiage as it relates to the user who is actually reading it. But I'm mostly worried about the corporate environment. Where a spam filter is going to judge the content of my email before my subscriber ever sees it, with little or no regard to what my subscriber has to say about it. Make sure you're focused on the right message at the right time. Spam at corporations is sometimes less of a penalty than it is at Gmail. For instance, if it's flagged locally in Outlook, they'll see an folder with a message count, whereas with Gmail that folder and message count is often hidden by default. If it's flagged at the server level before reaching their inbox, then they'll get an email once a day with a list of the suspect messages. If your message is relevant and wanted, it'll stand out in that notification email as if enjoying a nearly empty inbox all to themselves. And with a smaller population informing the filters as to what's spam and what's not, a positive "this isn't spam - please deliver to my inbox" from a corporate reader is a much higher vote than one Gmail reader indicating same towards the overall score of the sender. People will often try to make lists of words to avoid... don't say "free" don't say "rich"! don't say "timeshare"! don't say "dysfunction"! ... but if that's integral to your message, you have to say it and your message will get through if the recipient wants it. Make sure that people who are on your list want to be on there, intentionally put themselves on your list, find the emails to be of value and that if they want to stop receiving it, find it easy to stop receiving it. And then make sure your technology platform is reliable (SPF, DKIM, etc.) and your sending reputation is impeccable (IP address hasn't been involved in the past in sending spammy content). And then, of course, consider everything to be fluid and flexible - rules, technology, tastes all change at constantly. So watch your metrics and test, test, test. sounds like your willing to throw someone's hard work under the bus and possibly cause them issues (blacklisting) and report it as spam just cause you think the term is .... (old/over used/stupid) ? But, if it's not a joke, it's still a legitimate opinion and she's entitled to it. If the email makes her click "This is spam" for any reason then it's not the right message to the right person at the right time. When Tina says "I'm tempted to mark something spam because..." that's more info than we normally get when someone clicks the spam button. One person alone isn't going to tip the scales for the entire audience, but if lots of people are clicking spam, it's never the subscribers' fault. And so we do our best, and where we can, we test. "Click here" is one of my absolute biggest pet peeves as a web and email marketer. There are so many better calls to action than "click here." I was kidding about actually marking those emails as spam, but I'm quite serious about never using "click here" as a call to action on anything.